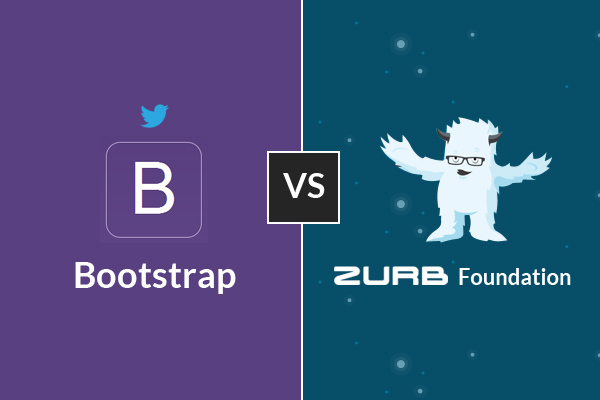 Bootstrap or Foundation: Which one is the Better Framework? If you are a web designer and looking for a simple, responsive and slick front-end framework, perhaps you have heard about both of the Bootstrap and the Foundation. That is because these two are very popular and effective frameworks right now. You may also think that Bootstrap has competition with Foundation and you have to select which one you want to use. Before you select any one of these two frameworks, you have to know that both of them have its own advantages and disadvantages. If you go through the following discussion you will surely make choice on which is superior based on unique situation, needs and familiarity with the code in first place. Bootstrap was built by earlier Twitter employees when the Foundation was an idea of ZURB which is a communication design company and can boast client list which includes Facebook, eBay and even NYSE. It is the most evident part of front-end framework. With the grid system, all of the designers will be capable of prototyping a variety of layouts and make any kind of essential adjustments. Foundation originally made its popularity with grid system. It is the first of the 2 frameworks not only to go receptive, but also to flesh out mobile-first method for a period of time. On the other hand, Bootstrap caught up after some time and has minimized the gap. It can be said that any slight benefit that the Foundation had at beginning with the grid system is practically gone now. There are still some particular grid features available in Foundation which is worth mentioning. It is called block grid, this actually empowers the designers to professionally divide contents of the unordered files into the grid which is evenly spaced. As well as, Foundation also can give it an assurance to speedily collapse columns in addition to remove the gutters since collapse class is present these. On the other hand, you can also remove the center columns by means of center columns syntax. The designers have capability of producing equal code snippet in those two frameworks which work almost in the similar way. Nonetheless, syntax for creating the grids could be a bit different. This means that the personal preference can be a decider at the end. Let’s talk about the pre-defined and flexible grids. Both of the Bootstrap and the Foundation bring an excellent built-in grid system which is completely in your zone to make customization with the Less & Sass, respectively. The default grid mode of the Bootstrap is mainly attached to the breakpoints. It means that it is going to provide you essential static-sized width which will draw back when viewport will be at its limit. If you want to calculate typography, width and mostly everything else, the Bootstrap mainly relies on the pixels; on the other hand the Foundation uses the rems. A clear difference between both of them can be identified, yet these two can make the similar outcomes. In addition to it is an individual preference thing of the web designers. When the pixels feel more recognizable to the web designers along with the graphic artists without much experience, the rems can help these designers think about the proportions more and more. You need to think about pixels as total units while the rems are the relative units. That is really something to think about, particularly in these days and age of the responsive design. Do not be very confused with too much thinking about distinction between Foundation and Bootstrap. This all actually depends on the personal preferences as well as comfort level. If you are an admirer of functioning with the pixels, Bootstrap would be the preferable framework for you. You will have to specially set exact height, width, padding as well as margin of the components along with their elements on every screen size and target device you are working with. The one who is just trying to be familiar with those two front-end frameworks, Foundation and Bootstrap, it may seem that these two have almost the same collection of the pre-built features. You should always remember that looks may be deceiving sometimes, because there are very small, but significant differences between those two frameworks that you need to familiarize manually with. Foundation brings the default form substantiation from Abide. The Bootstrap does not have such feature, but that would not be an issue as it all depends on the personal preference of the designer and his comfort in working with it. Interchange could be another excellent feature to the Foundation. This actually relies on the media queries for loading responsive content which is suitable for the different browsers. The right-to-left support and off-canvas navigation, tour and the pricing table complete the feature list of the Foundation. On the other hand, from the viewpoint of the designers, Bootstrap brings the features which feel more comprehensive as well as thought-out. The features of Bootstrap are pre-built and much more helpful in proficiently getting the designers up as well as running with aim to build a functional site with an exceptional theme. If you value the productivity, then the Bootstrap would be the framework of perfect choice. Bootstrap has added responsive embeds too. It makes sure to incorporate responsiveness now to a variety of elements. The names of these two front-end frameworks can give you some information about the visual customization of both. Bootstrap mainly removes the friction so that you would be able to build a site as proficiently as possible as well as have that up & running. The Foundation usually tends to present a few more customizable options, but this may slow down a bit. Your sites may expose that they were built using Bootstrap. You can change the default Bootstrap look by adding a theme and spending some time with the customization styling. If you do not want visitors to know that your site is built with the Bootstrap, just walk around the customization styling features for adding more exclusive touches to the appearance of your website. You may thank the early popularity of Bootstrap (because it gains more popularity than Foundation framework) for this “Bootstrap look.” The Foundation, on the other hand, has default appearance which would look very closer to the look of your browser. Consequently, it is a bit normal to tweak as well as shape into more unique and individualized design look. Considering the theme department, Bootstrap cannot be beat in sheer choice. This framework has a bigger assortment of the themes which are always available. The themes of Foundation are also available l, but the thing is that they are not available as the Bootstrap themes are. In addition to, unless you are a designer and want just to have all the websites look similar, you will naturally be grateful for the larger variety and choices that the themes offered by Bootstrap. Due to responsive design as well as the increasing fame of the mobile use, you would be frustrated if you cannot design any website with the mobile. It is appealing to indicate how every front-end framework usually handles mobile question. If the designers want to give look in their own way on computer or on tablet, then they will have to identify media query. It is known as the development of mobile-first CSS. The Bootstrap usually approaches mobile question from totally unusual angle. If designers wish for designing for mobile, they will have to identify media query especially for it. Again, if the designers do not design for their mobile first, then the mobile users need to be simply contended with viewing the desktop sight. Thing is, designing the elements with desktop-first approach means you will need to think harder to fruitfully arrange all the elements on mobile screen. On the other hand, the mobile-first approach of Foundation obviously lets the designers concentrate more on the relevant sort of content and interesting content to the users while the space consideration is secondary. The browser support as well as the performance is very excellent on the Bootstrap & Foundation. But there is only one exception. The Foundation cannot support browser of Internet Explorer 8. When the absolute performance between the Bootstrap and Foundation is discussed, it can be said that the differences are not all great and noticeable. Obviously there would remain minimal performance lacking, but both of them are mostly based on specific features (such as framework components or browser environments) that usually support designers. If there is only one category which can favor a framework over other, this may be community, where the Bootstrap has upper hand clearly. In addition to, the plugins and the widgets can be easily strapped onto framework and it would further extend the functionality of Bootstrap for more proficient web development. Which one is the successful Framework? It has already been talked about that there are several pros and cons to both of the front-end frameworks and the designer’s choice largely depends on the personal preference & comfort level. Bootstrap would give a way to you if you enjoy selecting a large collection of themes. There is no doubt about it. If you prefer rems over the pixels, then Foundation may not be so bad in the end. If you wish for enjoying support for the Internet Explorer 8, sticking to the Bootstrap would be better. If designing for the mobile first is very significant. Usually Foundation puts emphasis on this issue. Again, if the community supports and choices of plugins & widgets are imperative, you cannot simply beat the larger following and bigger selection of Bootstrap. However, in any case, if you like building stellar sites that actually live on the web, you cannot really be mistaken with the selection of any front-end framework. That’s why just ask yourself that which features are more functional to you from those two frameworks. The author is a copywriter and a blogger who has specialization in web design, conversion and worked with psddesigntohtml.com targeting its advance development. He has researched a lot on the front end frameworks, has a vast knowledge on converting psd to bootstrap and provided a very wise argument on the available frameworks.